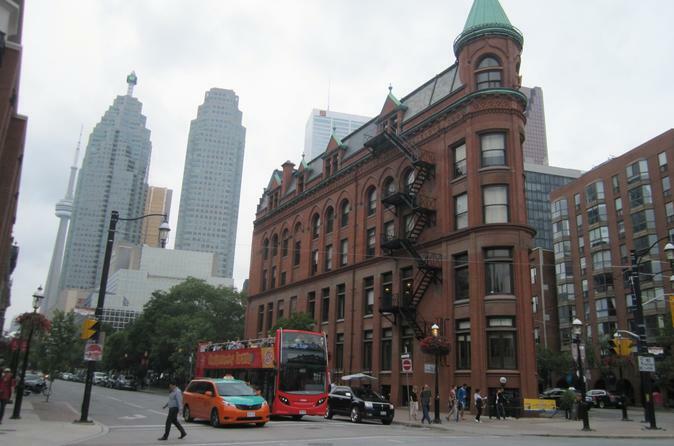 Experience an unforgettable walking tour in downtown Toronto with your private guide. This 2-hour tour will combine above ground and underground stops at entertainment, financial and architectural points of attractions in the downtown core area. You'll explore PATH, which is downtown Toronto's underground walkway linking 28 kilometers of shopping services and entertainment. Other major tourist and entertainment attractions include: Hockey Hall of Fame, Roy Thomson Hall, Air Canada Centre, Canadian Broadcasting Corporation (CBC), First Canadian Place, Brookfield Place, and Yonge-Dundas Square. Meet your private guide at your downtown hotel and then walk to Brookfield Place to see its beautiful architecture. Stop by Hockey Hall of Fame and continue walking to Toronto Dominion Centre, First Canadian Place, St. Andrew subway station, Roy Thomson Hall, CBC, and Ritz-Carlton Hotel. Afterwards, head up north to Sheraton Centre, City Hall, Eaton Centre and end at Art Gallery of Ontario. Other options include Old Town with its famous Flatiron Building and St. Lawrence, the number one food market in the world by National Geographic. Your private guide can customize the tour per your interests so that you have more time for shopping or entertainment attractions.